Club Campestre San Jose opened its doors in June 2007. With its spectacular views to the Sea of Cortez, canyons and mountains, Club Campestre San José invites you to enjoy the incredible panoramic views, dramatic elevation changes, and our undulating championship greens. The uncomparable shape of the course is second to none to any golf course in the world. Any avid golfer that steps into this beautiful facility feels that perfection is a constant while enjoying the rest of the amenities that this golf course has to offer. Created with masterful precision and challenging elegance, this unique golf course is nestled in the foothills of the Sierras and allows golfers to enjoy breathtaking ocean views from every hole on the course. Jack Nicklaus design. Golfers will surely like Club Campestre San Jose Golf. 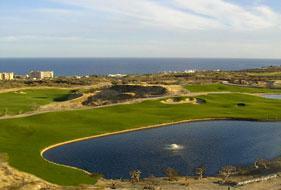 Club Campestre San Jose Golf is very famous golf course of san cabo lucas and cabo areas. Find the exclusive facts, figures and information on "cabo golf website". "cabo golf website" Also provide Villas and accommodations information for Cabo Golf Vacations, find the suitable vacation homes suggested below and enjoy your golf vacation in Cabo San Lucas. Golf Course Ratings - Black Tees = 6966yds with Course Rating of 73.5 and Slope of 137. Gold Tees = 6552yds with Course Rating of 71.3 and Slope of 127. Blue Tees = 6093yds with Course Rating of 69.0 and Slope of 121. White Tees = 5662yds with Course Rating of 67.3 and Slope of 117. Red Tees = 4917yds with Course Rating of 71.3 and Slope of 127. Includes - Half shared cart for one round of golf (with laser range finder), bottled water, use of driving range and practice balls, club service. TAX INCLUDED. Special rates for groups of 12 and up. Full pre-payment is required to confirm tee times. Reservations may be canceled a minimum of 24 hours prior to each tee time. For No-shows and cancellations out of time the full charge will be made. 10 usd will be charged for each canceled transaction. Dress Code - Appropriate golf attire is required. No swimwear, cut-offs, halter tops or tank tops, blue or denim jeans. Collars required.